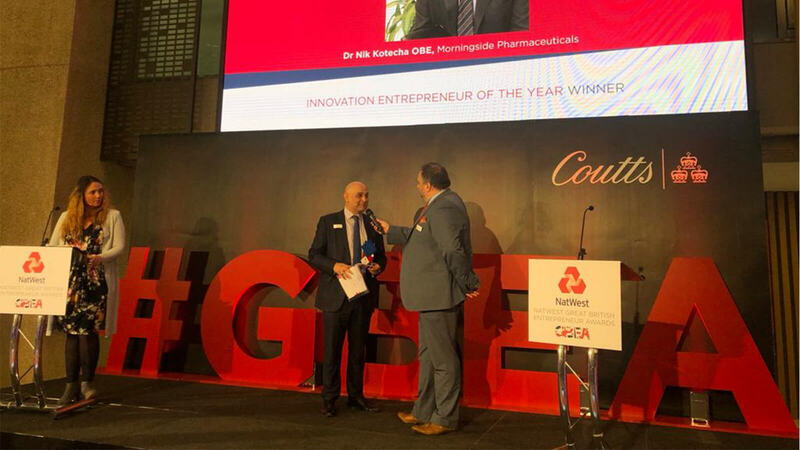 Morningside Pharmaceuticals’ Chief Executive Dr Nik Kotecha OBE has won a national award for taking an innovative approach to growing our business. Dr Kotecha was named as Innovation Entrepreneur of the Year at the Great British Entrepreneur Awards. He won through to the national finals in London, after winning his category at the regional ceremony for the Midlands, last year. After scooping the award, Dr Kotecha said: “I am truly humbled to be recognised nationally in this way and would like to thank my team for all of their support and hard work, as without them, this wouldn’t be possible. Since Morningside’s inception in the 1990s, the company has supplied quality medicines to more than 100 countries internationally, as well as become one of the leading manufacturers and suppliers of generic and branded medicines to UK pharmacies and hospitals. The company began as a garage start-up and Dr Kotecha has since grown the business by using innovation to embrace challenges with heavy investment, including research and development, and launching new niche molecules. Some examples of this innovative approach include being the first to launch the generic version of the contractive pill to the UK, in 2010, as well as creating slow and prolonged release tablets. Dr Kotecha also dedicates his time and resources to supporting many philanthropic causes, and works with a number of local and national business organisations in the community.